This was the first recipe I had done from Chang’s latest book, Baking with Less Sugar . As I’ve told numerous people, this book should really have been titled Baking with Less Granulated Sugar ; the emphasis is not on reducing sugar so much as getting the sugar from other ingredients — in this case, 14 ounces of bittersweet chocolate, more than twice as much as any other recipe calls for. Chang specifies at least 68% cacao for this recipe; ordinarily I would have used Valrhona Guanaja, but I didn’t have any, so I bought a couple of blocks of Callebaut 70% (exact formula unknown) at Whole Foods, and ended up needing only one of them. This recipe uses four whole eggs, and as the name suggests, gets its fudgy texture from mascarpone, the Italian fresh cheese best known from tiramisu. 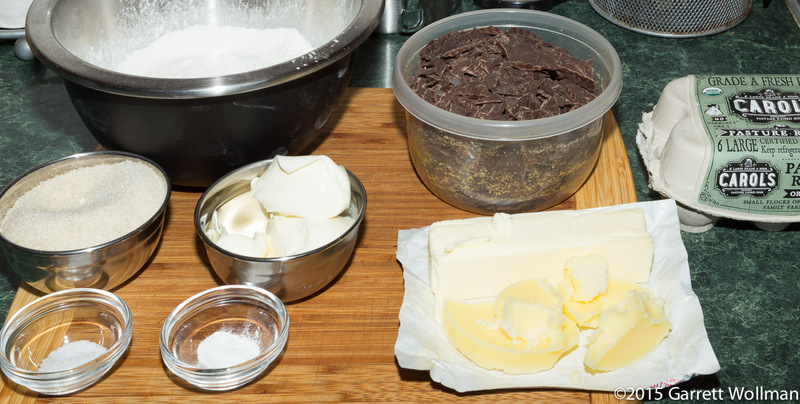 In terms of ingredients, this is one of the simpler recipes, although it is leavened; all of the flavor and perhaps half of the sugar comes from the chocolate, but that’s filled out with 140 g of granulated sugar. Mascarpone, as the title suggests, is the only unusual ingredient. The butter looks a bit odd because some of it was previously melted by mistake and resolidified in the refrigerator; since it was all going to be melted again (and it never got hot enough to evaporate the water or brown the proteins) this was not an issue. The assembly follows a variation on my procedure #2 (see part 2 of this series), with the mascarpone beaten together with the eggs before adding the granulated sugar. 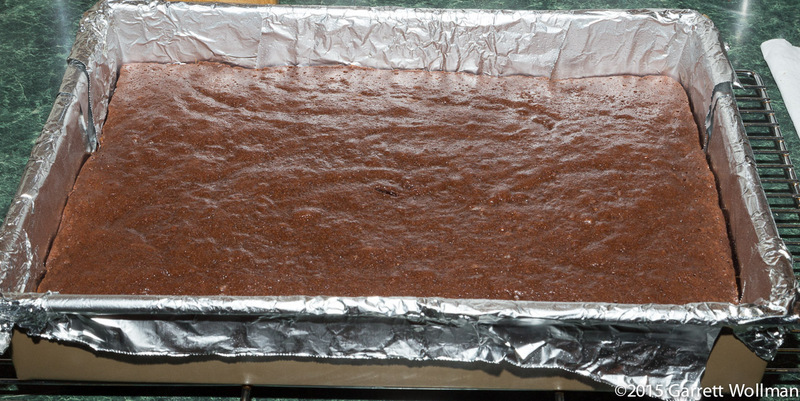 These brownies bake for only a very short time, although I found in my oven that that it took towards the longer end of Chang’s estimate to meet the specified “few wet crumbs” termination condition. I finished this batch late in the evening, so I saved my portion on a plate for lunch the following day after all the rest went into a plastic bag to be frozen. I thought these brownies were excellent in the texture department, but a bit lacking on chocolate flavor — something which could perhaps be remedied by using a different dark chocolate as the flavoring, like my old friend Valrhona Guanaja, or even a higher-test chocolate (of which there are now some, made specifically for baking rather than eating, in the 72–75% range). The tasters seemed to agree, giving high marks on moistness but ranking them sixth in the overall evaluation (3.9 score, n=5); one taster chose this recipe as overall favorite. All of the evaluation scores were better than “average” (3.0), although this may be confounded by one taster who was evidently confused about which was which and gave them a rating in the “topping” category. As with the other brownie recipes we’ve looked at so far, these count as “A Low Sodium Food” under FDA regulations. 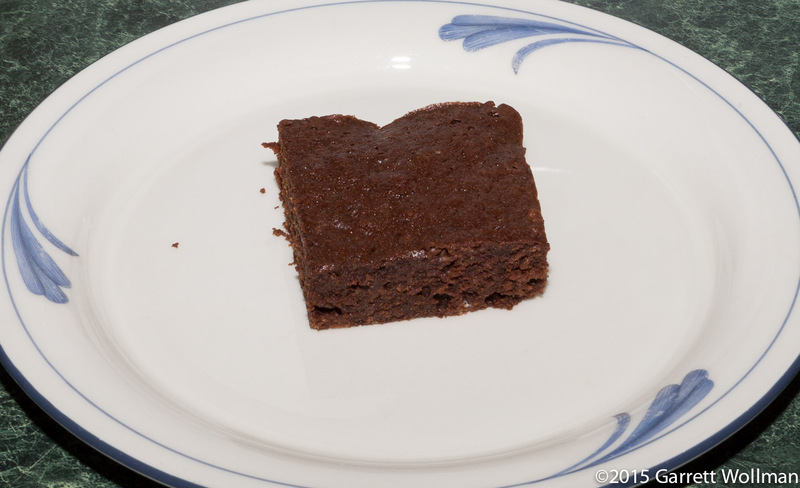 This entry was posted in Food and tagged browniefest, brownies, chocolate, Joanne Chang, recipe. Bookmark the permalink.